Tinder, Grindr, OkCupid—there’s no shortage of apps for gay men looking to find Mr. Right—and especially Mr. Right Now! If you’re looking to find something serious, or at least more than a spontaneous rendezvous, it could be time to get off the hookup apps, and invest in one of these top dating sites for gay men. Zoosk is a major player in the dating site world, with more than 30 million users—including 1 million gay daily users. Its “behavioral matchmaking” technology tracks your preferences as you surf the site, and uses that information to improve its match suggestions. The suggestions come to you by way of the “carousel” feature, an easy-to-use pool of profiles you can swipe through one by one, clicking yes, no, or maybe. This gives you a little taste of the fun you know from Grindr or Tinder, but on a more commitment-oriented platform. You can send smiles or likes to other members, and you also have the option to spend a little extra money to purchase Zoosk coins, which can be used to buy presents for potential suitors—unless you think that’s coming on too strong. With a free account you can browse the site and look at other users, but you won’t be able to contact anyone. You can get a 6-month membership for $12.49 per month, 3 months for $19.98 per month, or 1 month for $29.95. Match makes it easy to search for all types of gay singles. Better yet, you can cruise for guys with the “mutual search”—which looks for men with similar goals to you. You can also search with the reverse match, where you search based on specific criteria that you select. Whoever you decide to connect with, you’ll rest easy knowing that Match screened their profile to make sure it’s legit. But what’s the point of meeting a single guy if you can’t flirt? Match includes 7 quick games that you can play to see who you’re compatible with. With names like “romantic rip-off,” “name that dance,” and “gut reaction,” the games are fun and a good way to learn a little bit about the person on the other side of the computer. If that doesn’t work, you can also attend one of the monthly “stir” events, to see if you have more luck in the real world, during happy hour. You can create your own profile with photos with a free 7-day trial membership that will give you all the benefits of a paid membership. After the trial is over you won’t be able to contact other users without choosing a paid subscription. Paid memberships cost $12.99 a month for 12 months, $21.99 a month for 6 months, or $23.99 a month for 3 months. If you decide to go with the “bundle plan” which includes email read notifications, first impressions, and highlight profiles, you will pay $20.99 per month for 12 months, $23.99 per month for 6 months, or $27.99 per month for 3 months. EliteSingles is the go-to for gay men looking to take some of the guesswork out of dating and meet career-minded, commitment-minded men. With Elite Singles you answer dozens of questions on a personality test designed to help determine which guys are the best match for you. On EliteSingles you’ll receive around 3 to 7 matches every day, and the service allows you to easily reach out by text message. The guys you meet are a lot less likely to be scrubs—82% of users have a university degree. That’s the EliteSingles recipe—fixing up people who are at the top of their game, know they’re worth it, and want somebody to share it with. EliteSingles has the sort of pricing options you’d expect from a service geared toward busy professionals. A single month membership runs $99.95, while a 3-month package is $59.95 a month, and 6-month packages are $39.95 a month. You can sign up for free, build a profile, upload photos, take the personality test, receive partner suggestions, and send smiles and likes to matches, but you won’t be able to send messages to other members without a paid membership. Compatible Partners is a dating site for gay singles who are serious about finding a committed relationship, and not just looking for a fling. With a relatively high price tag and the amount of time it takes to sign up, it’s not for casual daters. But maybe you’re at the point where that’s a good thing? When you sign up for Compatible Partners, you’ll need to answer a highly-detailed relationship questionnaire. After you fill it out, which takes about 20 minutes, you’ll start receiving matches on a daily basis. If you need some help cracking the code of first date small talk, Compatible Partners can help with guided communication. You can use Compatible Partners for free, and browse member profiles to see what’s out there. Once you get a paid membership you can communicate with other members, see photos of your matches, browse outside your preferences, send and receive unlimited messages and see who viewed your profile. The Basic Plan costs $59.95 for one month, $39.95 per month for 3 months, and $29.95 per month for 6 months. The Total Connect Plan includes the RelyID feature, which verifies your ID and the plan also allows you to carry out secure calls with other users. The Total Connect Plan costs $44.95 per month for 3 months, $33.95 per month for 6 months, and $23.95 per month for 12 months. Your 30s and 40s were fun, but if they’re a bit back in the rearview and you’d like to find something serious, maybe it’s time to check out OurTime. The site is geared specifically toward people over 50 and is all about putting compatibility first. Compatibility matters, and OurTime lets you filter out matches based on your preferences, so you can put your likes and dislikes front and center. The site also lets you swipe through the potential matches, much like with apps such as Tinder and Grindr. If you’re worried about safety, OurTime has implemented some serious security measures to protect you and your data. The site also offers important tips about dating safety. The site is easy to use and has a customer service team that is very responsive. You can sign up to OurTime for free to start browsing gay men. In order to communicate with guys, you’ll need to choose a paid subscription though. Choose a 1-month plan for $29.95 or a 6-month plan for $17.96 per month. Being single can be fun, but if you’re looking to settle into something more serious, these dating sites can help you make a connection more meaningful than your last fling. 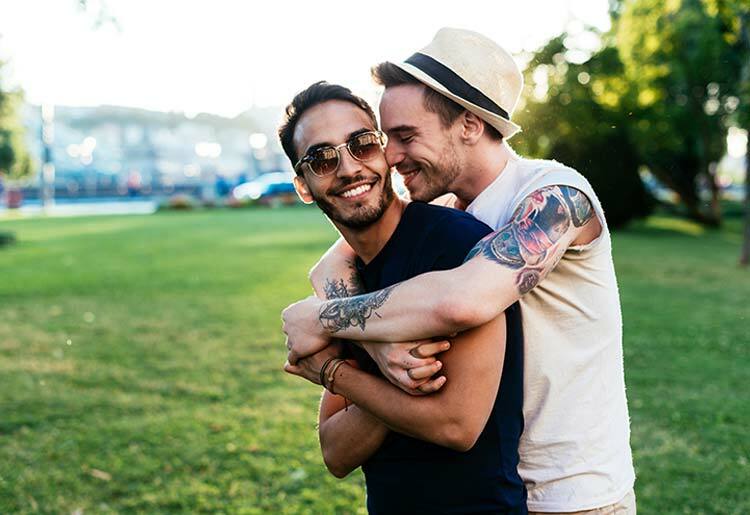 These days there are more gay dating site options than ever before, and they have the know-how and experience to help you make a meaningful connection. All you have to do is figure out what you’re looking for, open your mind, and take the plunge.